What is Semantic Computing, and Why do we Need It? Semantic computing allows a program to perform computations based on type rather than relying on imperative methods operating on “meaningless” values. While the above is useful, the full power of semantic computing is revealed when used in conjunction with a publisher/subscriber mechanism and therefore, from my perspective, a pub/sub is an integral part of defining “what is” semantic computing. 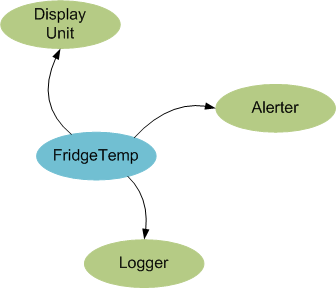 I’ll use a simple refrigerator temperature sensor as an example (C# code). This implementation is monolithic — it’s behavior is fixed by the programmer. The temperature type, a double, is meaningless to the machine. Meaning exists only in the human-produced code, and even that is limited and error prone. Digging deeper, the concept of temperature unit (is it Fahrenheit, Celsius, Kelvin, etc) is completely missing. Even though somewhat contrived, this is how I see 99% of coding done today (including my own) and, in my opinion, is the core reason for why programs have bugs and limited lifetimes requiring complete rewrites every three to seven years. These subscribers “listen” to specific semantic types and perform computations autonomously when that type is published. NASA lost a $125 million Mars orbiter because a Lockheed Martin engineering team used English units of measurement while the agency’s team used the more conventional metric system for a key spacecraft operation, according to a review finding released Thursday. If Lockheed Martin had used semantic types for the Mars probe software, the compiler would have reported the error in English vs. metric unit differences (source), or even better, would have provided automatic conversion. Instead, $125 million of taxpayer money went, if not down the drain, then either into deep space or in the creation of crater on Mars. Non-semantic programming is monolithic, non-extensible, and, lacking typeful meaning to both the program and the programmer, results in costly bugs and limited application lifetime. Semantic computing is dynamic, extensible, and conveys typeful meaning to the program and programmer. applications have less bugs when using semantic types rather than native value types, semantic types have meaning to both program and programmer, and a semantic architecture is more resilient to product enhancements, technology changes, and so forth. In this article, I’ve re-written the HOPE engine to utilize “type declarative programming.” This is a style of programming that relies heavily on generics to declaratively describe what should be done, not how. It is the other side of the TFD coin — in addition to developing types first, we also implement processes that operate on generic types, particularly those that implement specific interfaces. Similar to how events, delegates, callbacks, and so forth are used for an inversion of control with regards to program behavior, “type declarative programming” is an inversion of control for instantiating objects. Unlike HOPE, where types are declared in XML and compiled at runtime, here we use types implemented in the code itself. Because of .NET’s rich reflection and assembly loading capabilities, the difference is irrelevant to the overall goals of HOPE, but the difference to the developer is significant, especially with regards to the safety that a typed language gives you at runtime and the ease of programming (Intellisense and compile-time checking) in a typed language during development. Type First Development (coined by Tomas Petricek) is applicable to imperative languages as well as functional languages. We can use the C#’s type system to create rich types and declaratively establish the relationship between types and the methods that process those types. We can also create containers (membranes) to create computational islands and control the flow of type instances between computational islands. By using a semantic processor, the membranes, types and receptors that are declared in a “semantic system” becomes a expressive computational unit. Specialized receptors, such as the distributed receptors illustrated in this article, demonstrate how easy it is to create a distributed semantic computing system.